I can’t wait to jump in this tub with a beautifully scented lavender candle and relax. 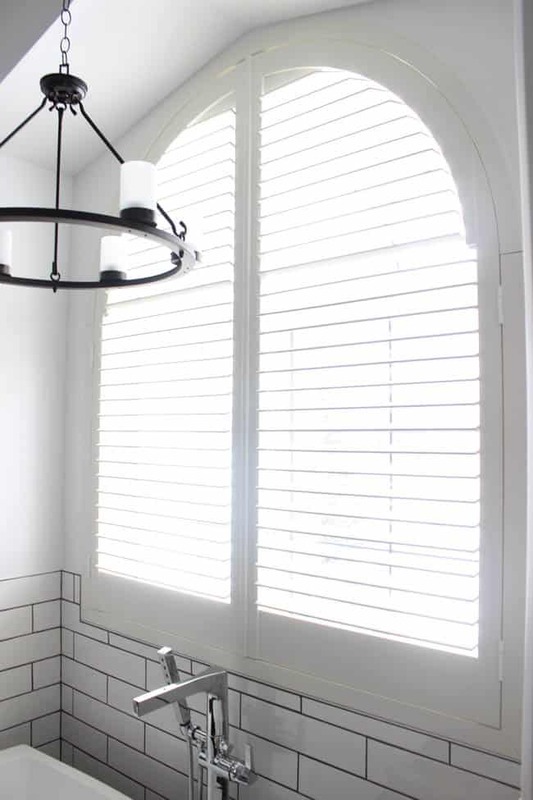 These shutters were a huge improvement to what used to be in this spot and we LOVE them – they are the perfect addition to the bathroom, and they let in a ton of light! Such a beautiful window covering option! 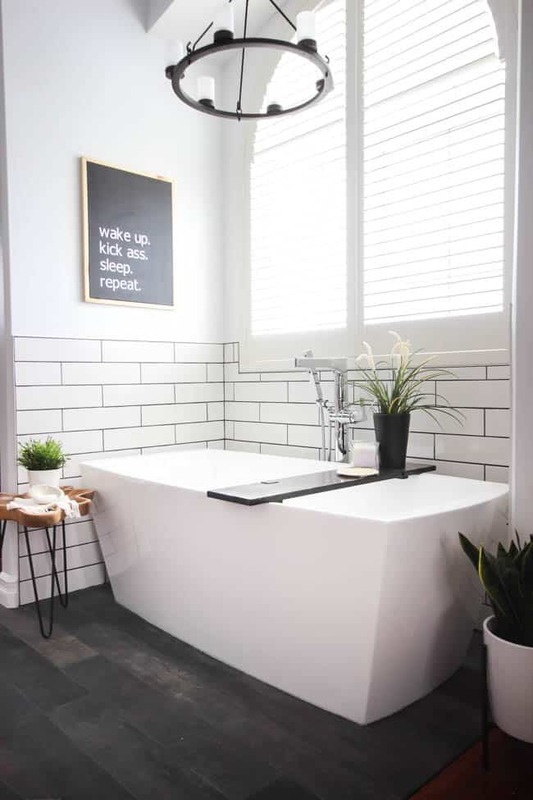 And our standing tub filler is a dream come true. 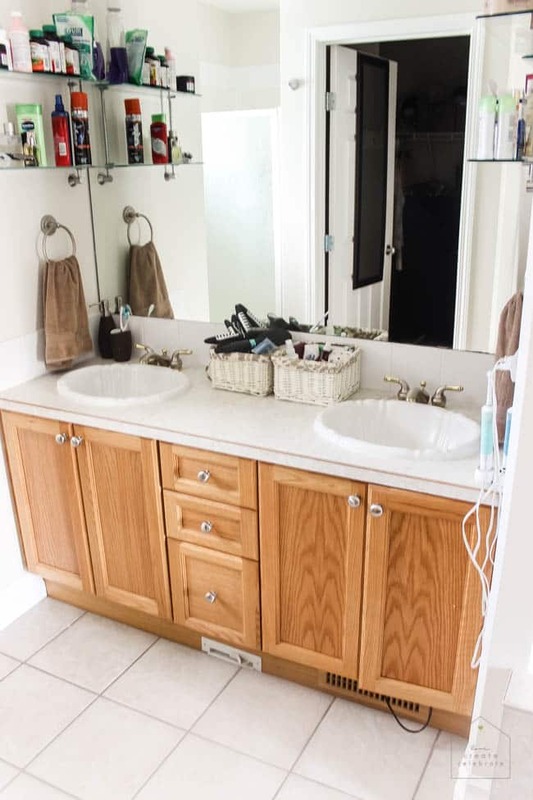 I really wanted a small table to sit beside the tub and transition between the tub and vanity areas. I was so happy when I found this one! 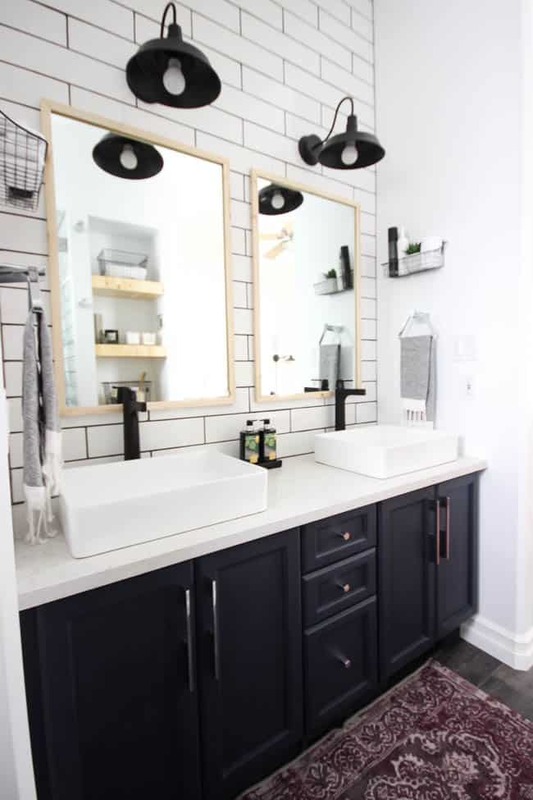 My husband was unsure about painting those navy cabinets… but they were a definite win! 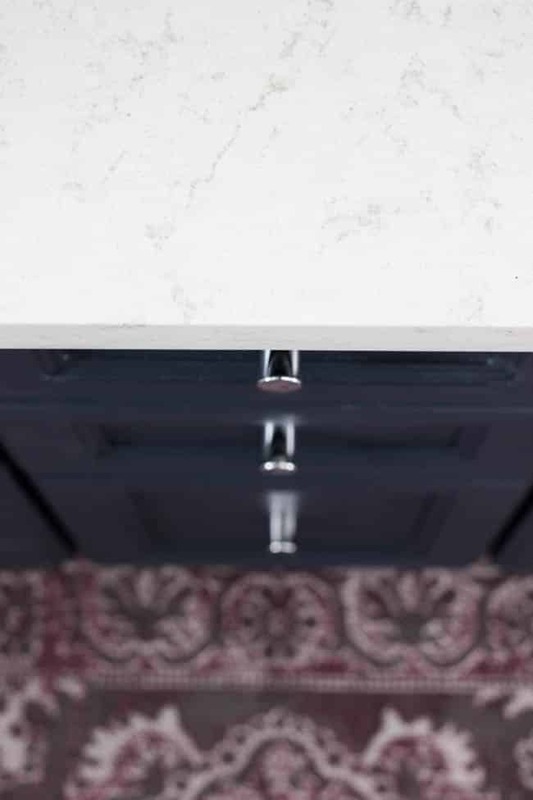 The quartz countertops were a great decision. They tied into the space sooooo well! 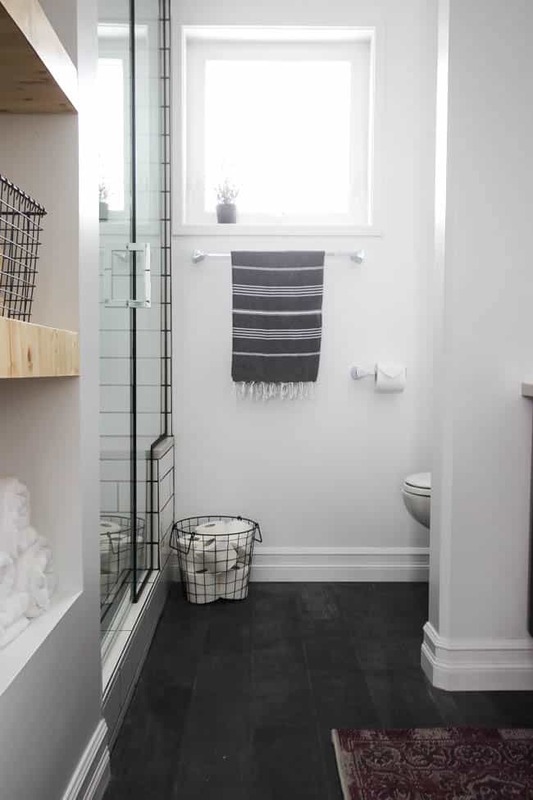 I couldn’t believe how perfectly they pulled the colours in the space together with just the hints of brown and grey. 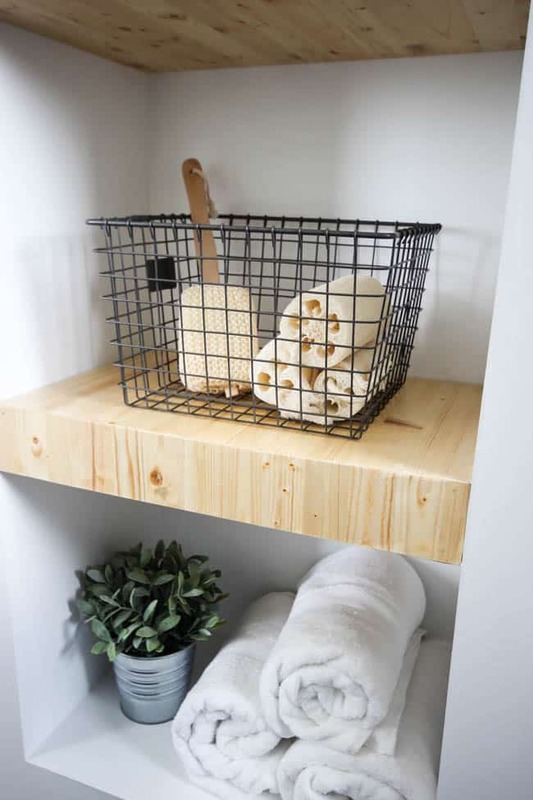 There are a few DIYs in this space that we will share soon, including the built-in shelving, the floating shelves, and the DIY vanity mirrors. 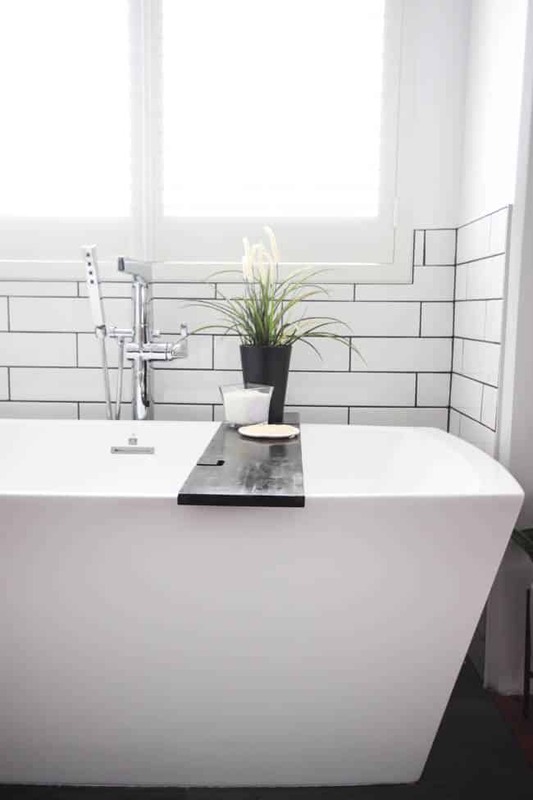 Our rectangular vessel sinks were perfect to complete the modern feel of the space. 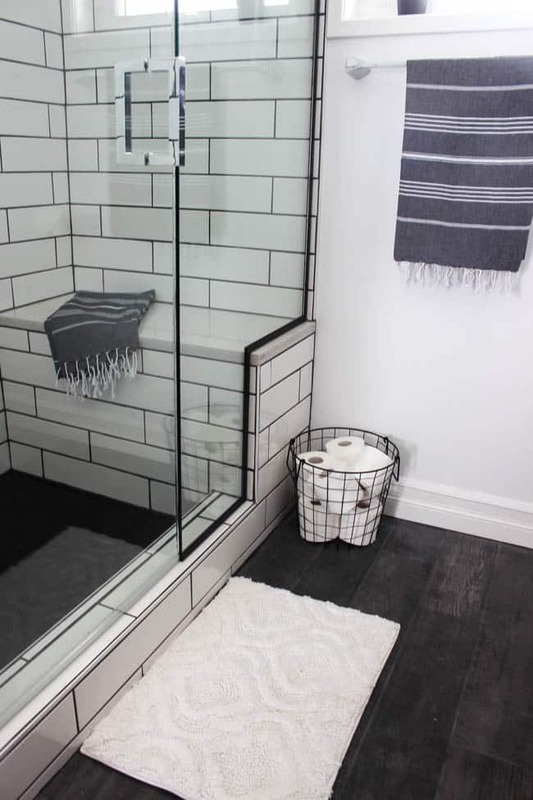 The chrome towel racks are stunning in the space and the perfect size for the hand towels I picked out. 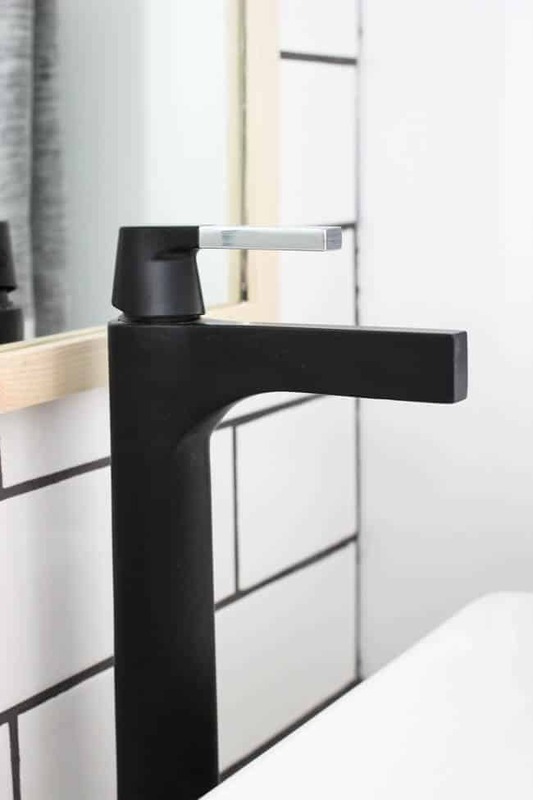 I’ve dreamed of having matte black faucets for a long time and I was not disappointed. They are such a beautiful stand-out feature. 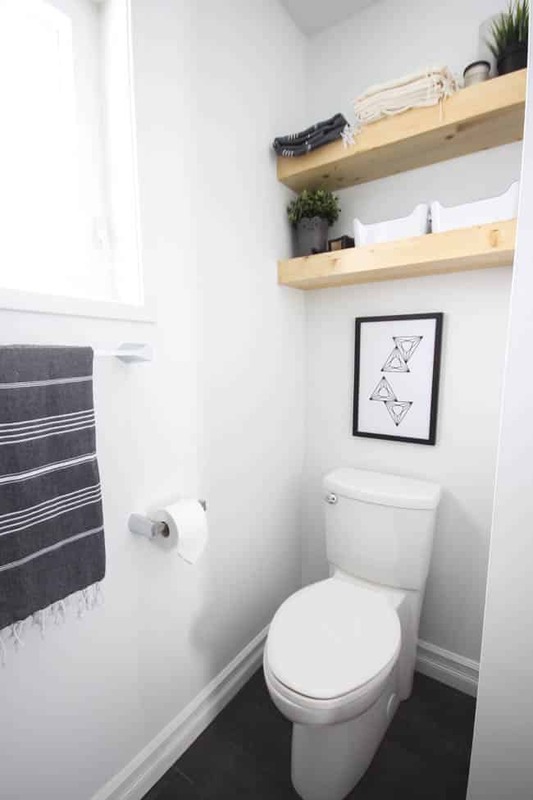 We even upgraded the toilet to one with a consealed back, and even it looks sleek and modern in this space. 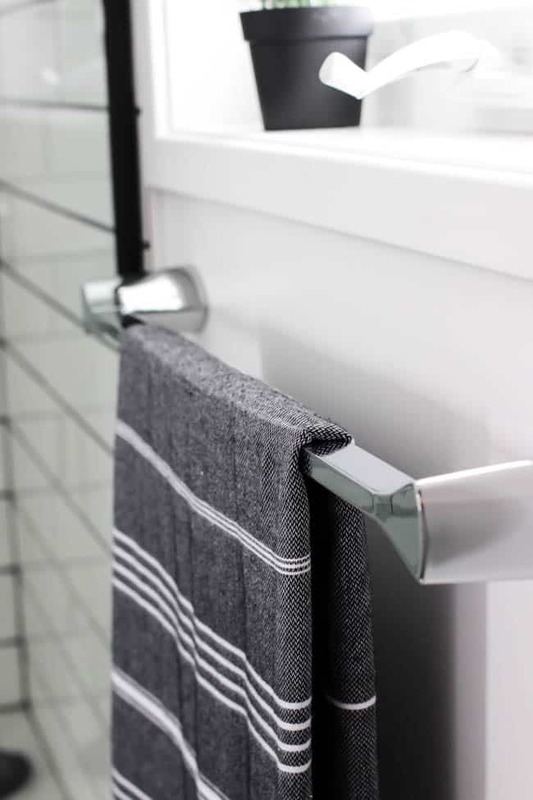 The towel bars and robe hooks could not be better suited for the bathroom. 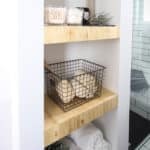 I never realized the impact that small pieces like that can have in a space! And then there is my husband’s favourite part…. 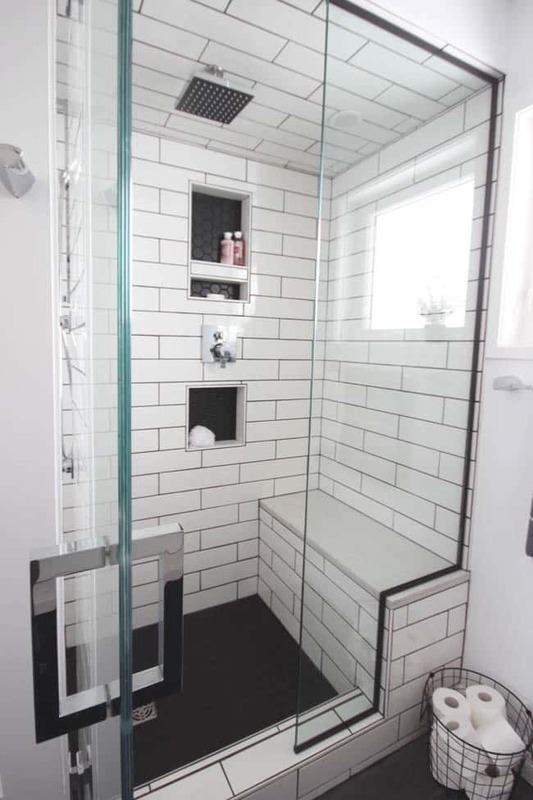 the beautiful glass doors to our tiled shower. 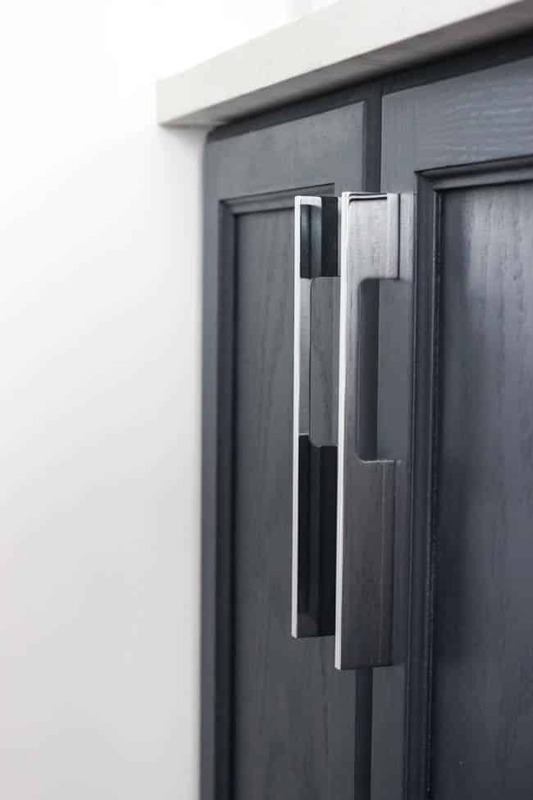 I LOVE the black casing around the glass door, and the chrome, square handles. 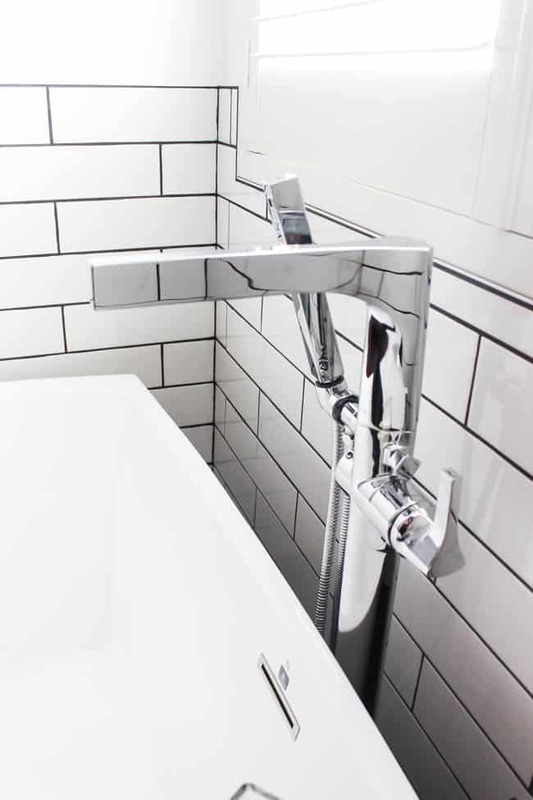 Most of the chrome shower faucets and accessories were from the same collection: rain head, shower head, body jets, and diverter. 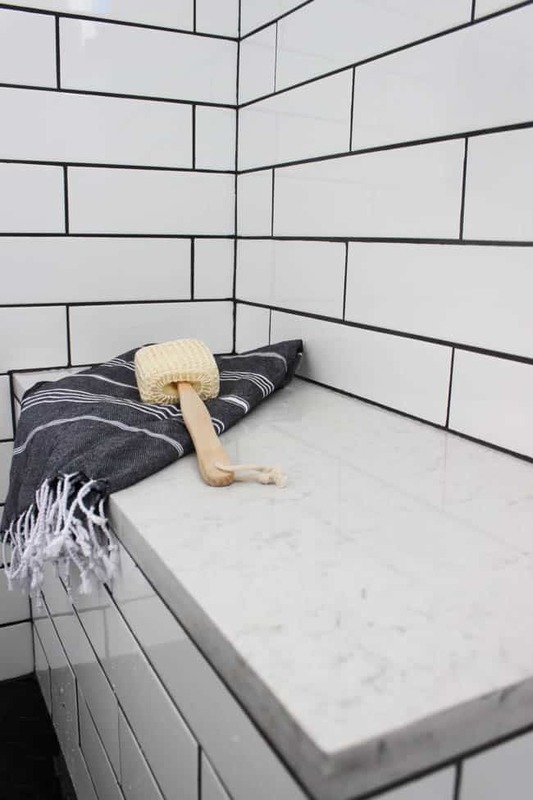 We used the same quartz slab on from the vanity on the shower bench as well. At the last minute I also added one new piece of artwork that I think works perfectly in the space – I’ll share that tutorial soon! I promise that I’ll share a full sources list soon, but for tonight, I’m off to take a soak in my beautiful new tub! Let me know what you think of the space! Thank you all SO much for following along with our renovation! SEE A FULL LIST OF SOURCES HERE! Oh my goodness!!! SUCH an amazing transformation! I couldn’t possibly choose a favourite part … everything about this is just absolutely perfect!!! 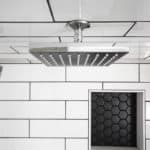 Your shower looks great! What did you do to edge it around the nook and the threshold? 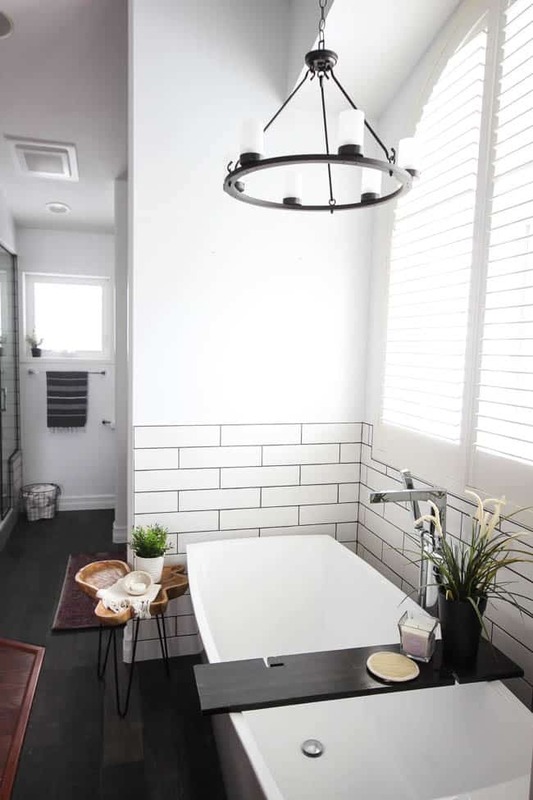 Is that a white tile edging? 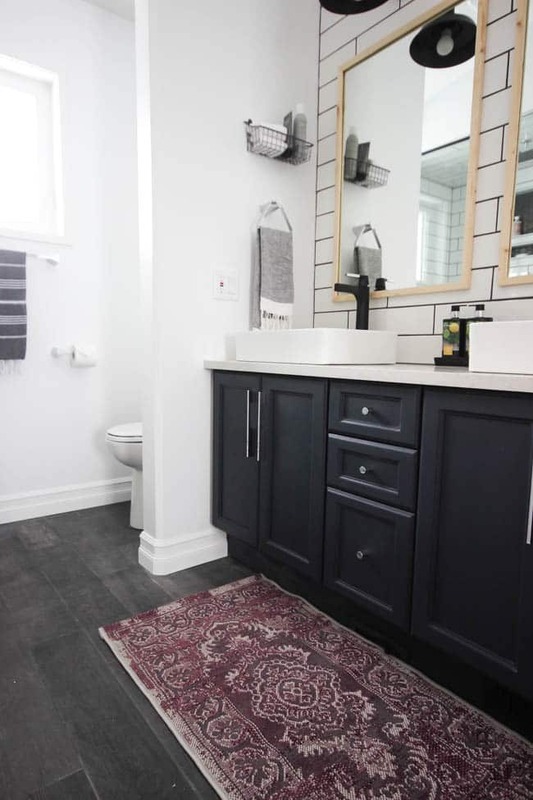 Not sure if I am missing it somewhere, but where did you get the floor tile and what color is it called? Linda, you have outdone yourself! 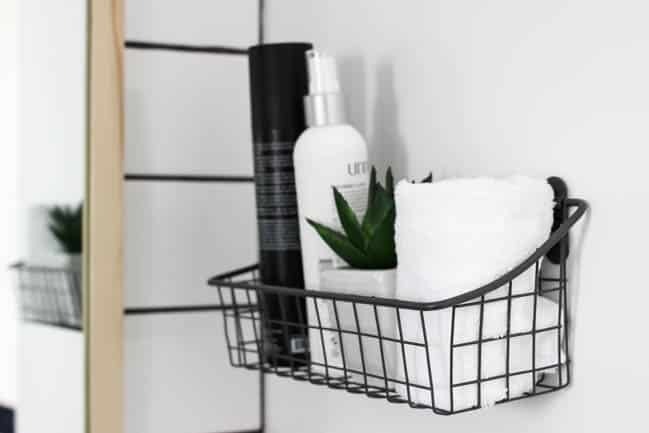 I love the small details, like the shampoo shelf in the shower and the black border around the glass! I need to know where you got the maroon rug and all your light fixtures?! I’ve got a client with the same colour scheme! Way to go! Thank you! I’ll share all of the sources very soon! I’ll let you know :) I was too excited to get the post up, lol. Thank you my friend! We used a router for the tray! A jigsaw would’ve done a hack job on that I think, lol. I’ll share the tutorial soon hopefully! DAYUM Lindi, this is seriously legit. I LOVE everything about this, and after seeing it I now want to burn my house to the ground and start all over again! I LOVE it!! So many great features! 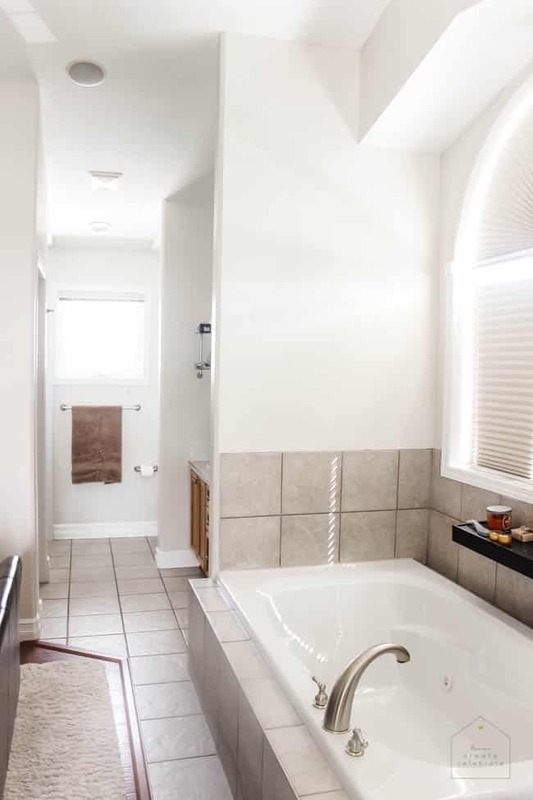 That tub has me swooning. 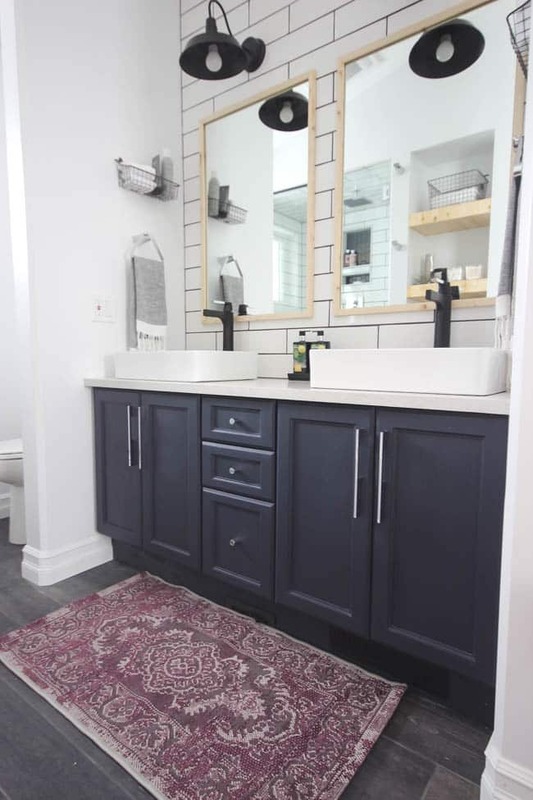 It flows together so beautifully with the modern touches and warmth from the cabinets and rug. I know that you have to be so excited!! Enjoy it! 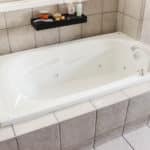 The tub is amazing! I can stretch out entirely inside there, and the water is SO high! It’s been a long road. We are so happy to have it done! GIIIIRRRL, you can come and do mine. I’ll take the exact replica, please! It looks so amazing! Haha, I don’t know if you’d like my rates? lol. I’ll try to share as many details as I can for you to replicate, lol. YES!! We are soooo close to the finish line! I can’t wait to take a reno break, lol. 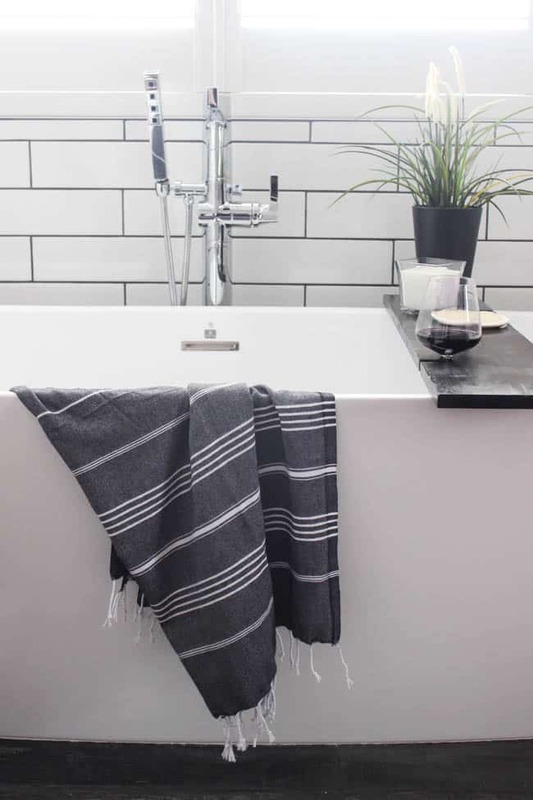 But it’s all worth it – the bathroom is perfect! It looks absolutely beautiful. Great job! Lindi, this is a truly amazing transformation! I love every single detail, beautiful!!! WOW! This is so stunning, I love everything about it! 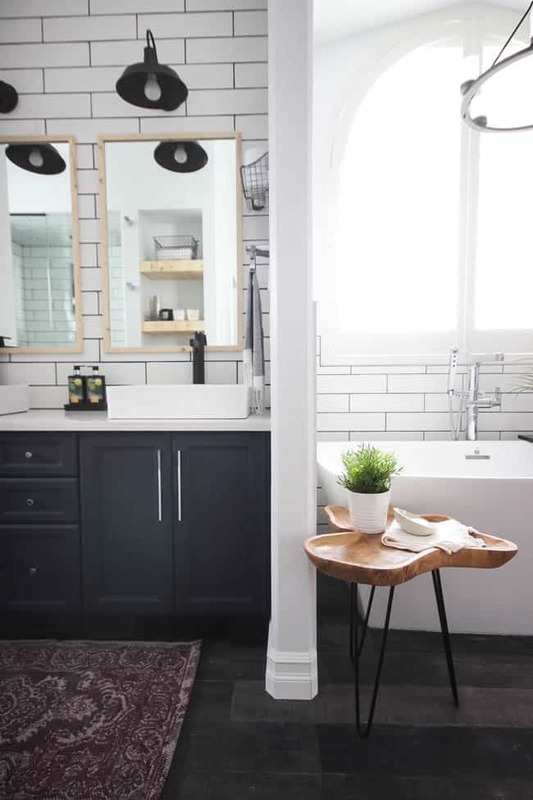 Wow, what a gorgeous bathroom. I love all the little details! 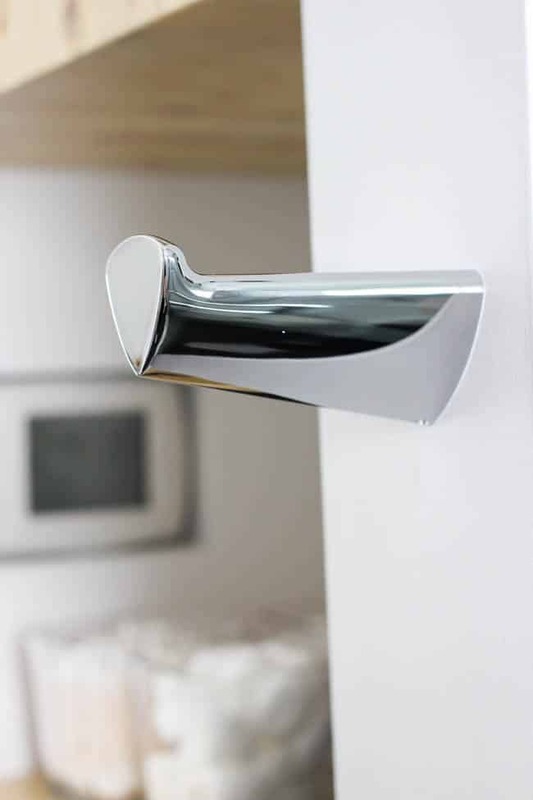 Allll the heart eye emojis for those black faucets! Wow!! It looks amazing!!! 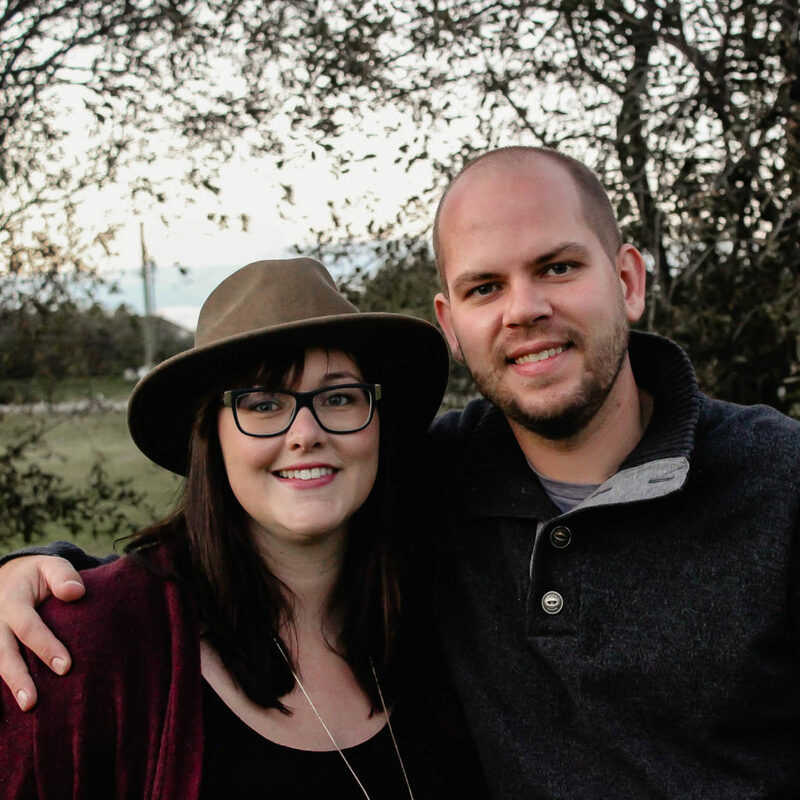 What an accomplishment Lindi & Rus!! Looks like something out of a magazine! This looks great girl! 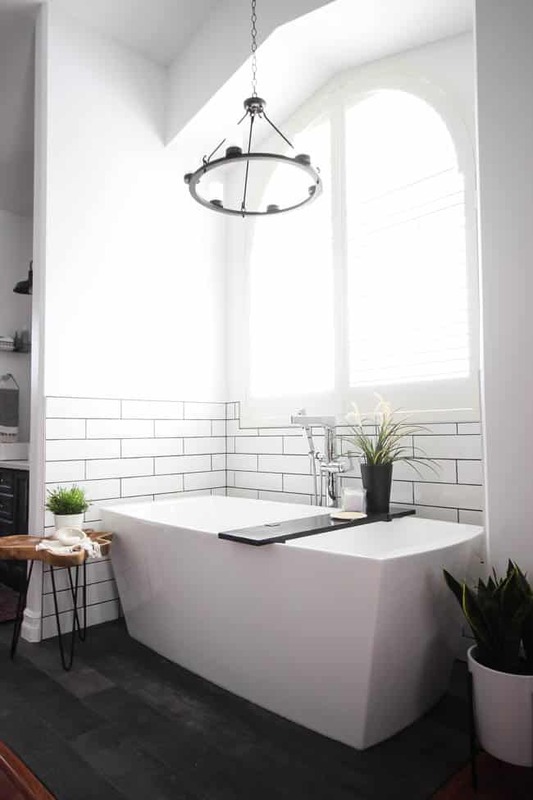 I love the tub and the dark grout against the white tile. 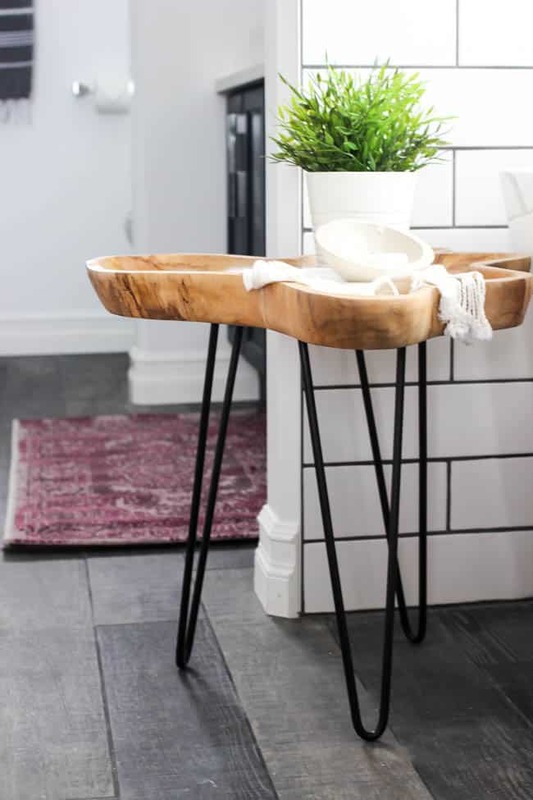 This is very beautiful and I love anything Modern, great ideas for my upcoming bathroom I am installing above the garage. Gorgeous! 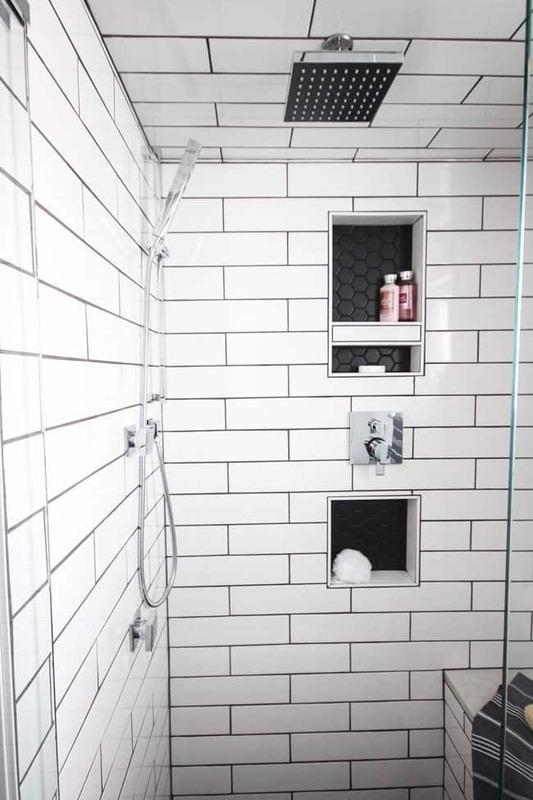 Can you tell me what color grout you used for the white subway tile in the shower? Love this look! We are getting ready to build and I feel overwhelmed with decisions. I’m so glad to see you mixed navy and black. 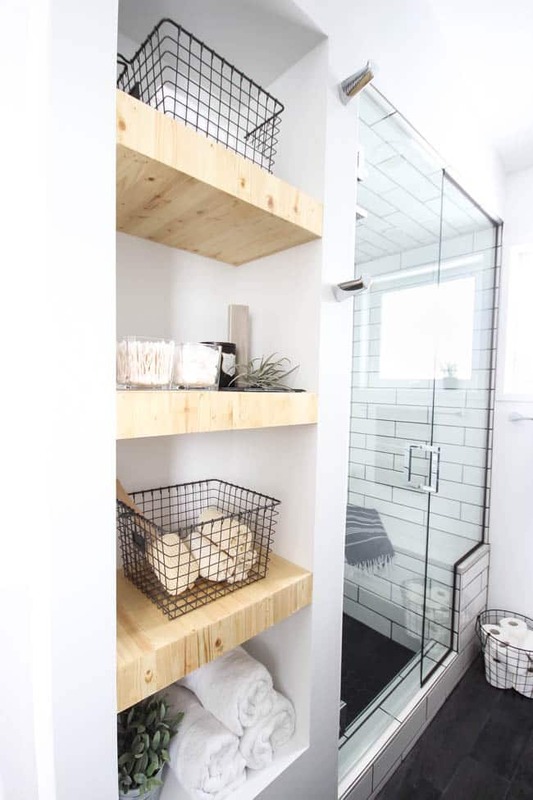 I want to do the same, navy island in my kitchen and matte black hardware on all interior doors and some features of the bathroom, etc. I have searched and searched bc I want to see the combination before I pull the trigger. 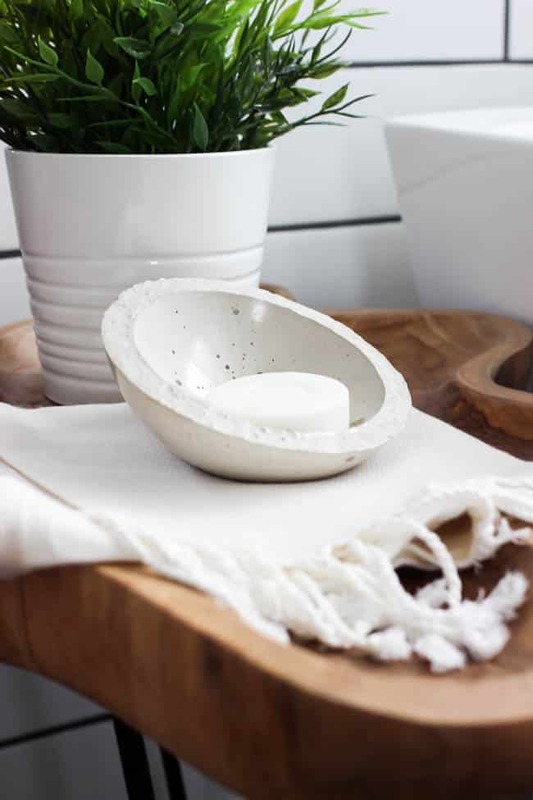 Love how it looks in your bathroom! Thanks for sharing! That will look amazing!! I’m so glad you stumbled across this room! 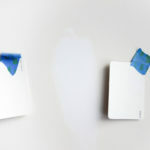 Stay tuned – I plan to to use the navy and black in a few more room renovations too! Thank you so much for leaving your comment! It’s open all week & growing….would love to have you at the party! Oh myyyyyyy — this is gorgeous. Every detail seems perfect. 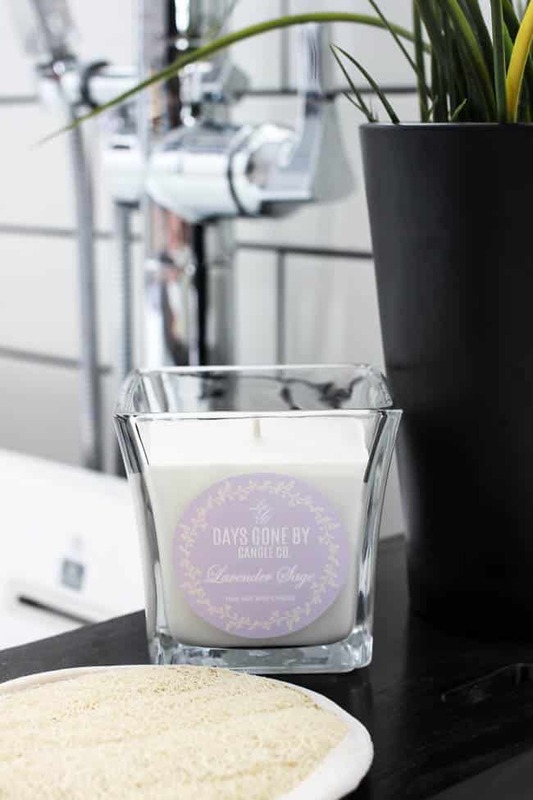 The tub, the sinks, the faucets, the lavender candle, the side table. I would spend a lot of time in this room. Well done. I saw your link at The Creative Circle party. Awww, thank you so much! This is probably my favourite room in the house! I hope you stop by again sometime! this looks amazing. wow. i want it ALL! enjoy! Haha, thank you! I’m so glad you liked it :) There’s a whole list of sources if you’re looking for anything in particular! 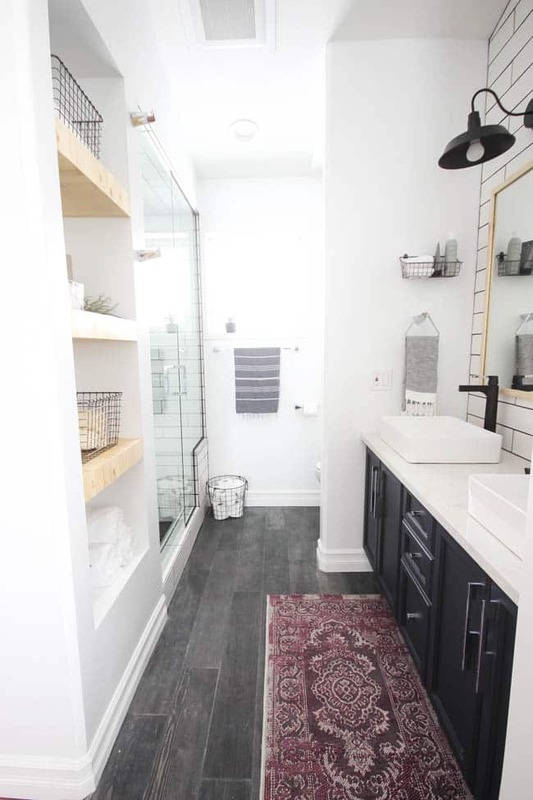 What a stunning remodel! I do have one question though. You said that your husband was unsure of painting the cabinets navy. I’m wondering why you chose to introduce navy with all of your black, brown, and gray accents? Whatever the reason, it’s beautiful. PS – thanks for stopping by! I’m so glad you love the bathroom! 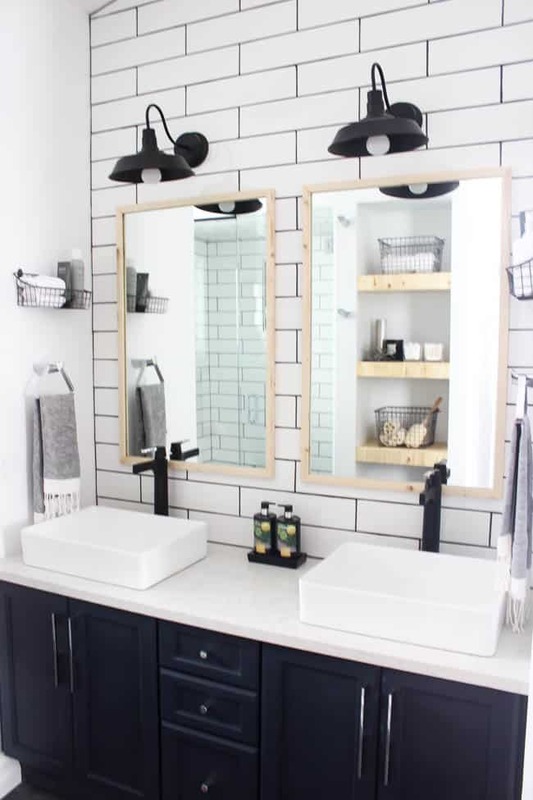 OBSESSED with your bathroom! 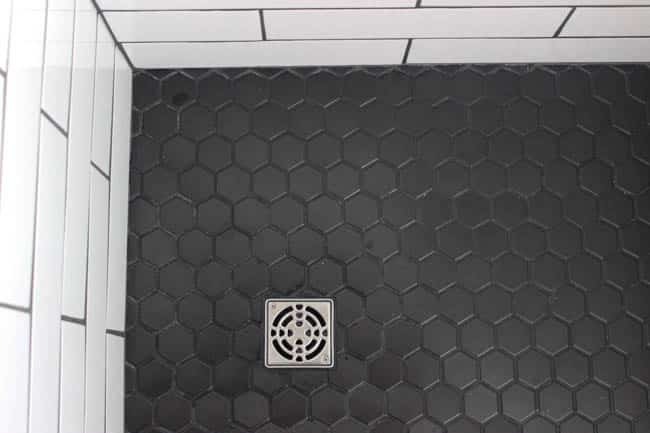 What is the product name for the hexagon tile, and what grout did you use! I need it in my life! Aww, thank you!! 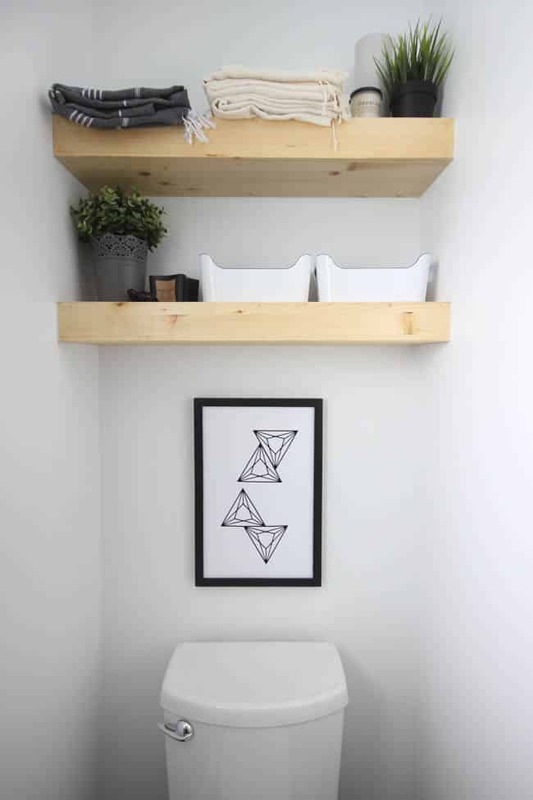 We love this space! 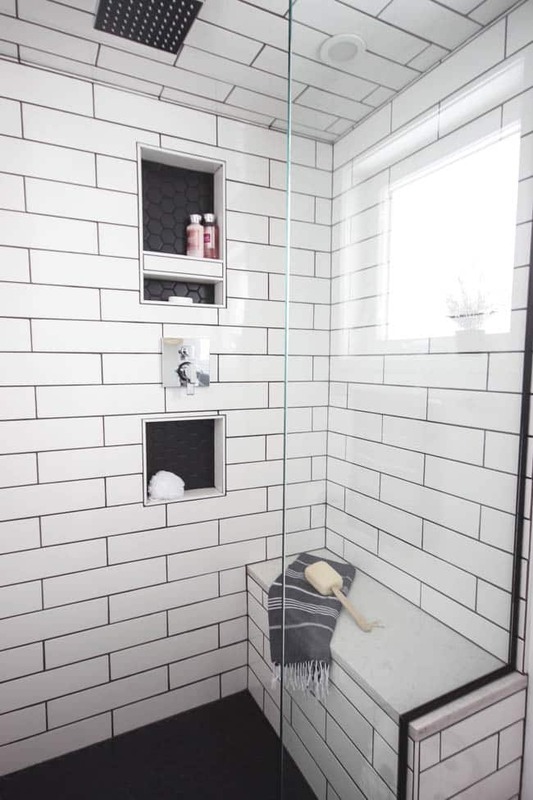 I’m not sure of the name of the tile, I think there is a link to it in the source list (linked at the bottom of the post!). 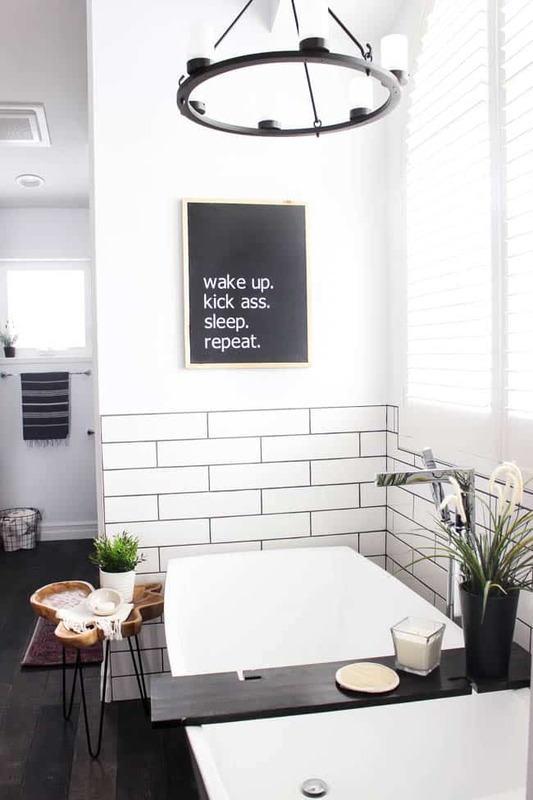 The grout was a dark black. Sooo good! Gorgeous! 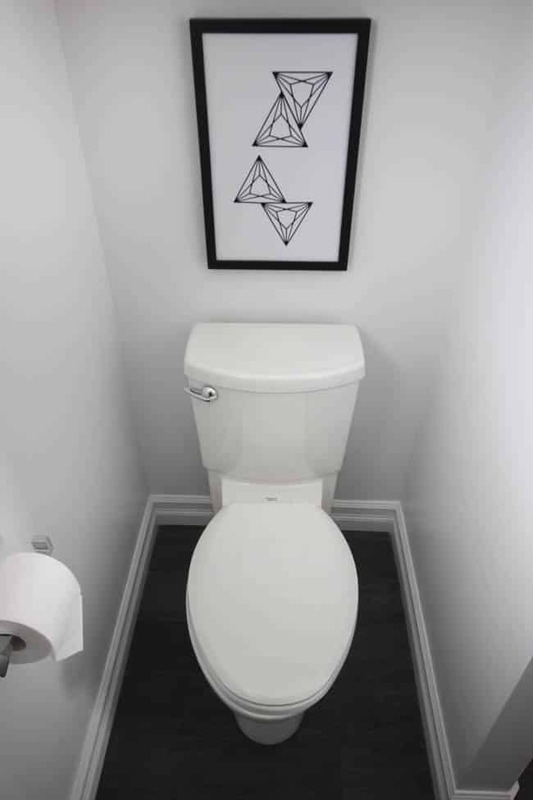 This is the best bathroom I have seen so far. Maybe because of the choice of colors you used. One can never go wrong with black and white. This is totally an inspiration. Thank you for sharing. 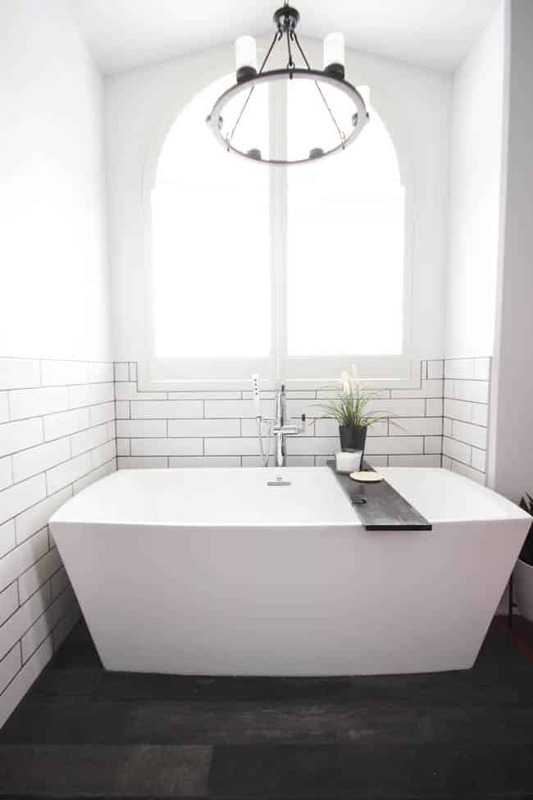 That is a stunning bathroom. 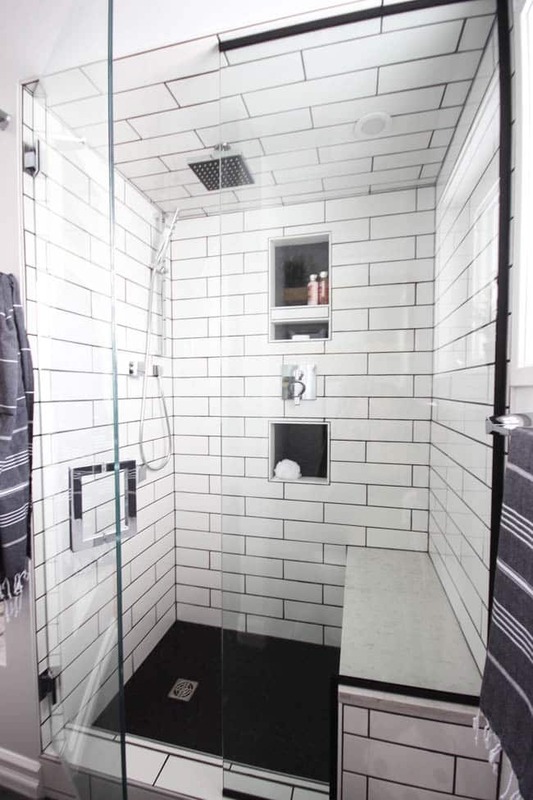 The shower is absolutely gorgeous. I love the seat in it. Great job on the renovation. I think your bathroom is bigger than my bedroom! LOL! You did a fabulous job! Great job ! I love the color scheme. 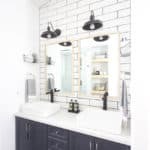 Can you tell me what color grout you used on the white tile? Hey there, love the remodel:) Question for you. 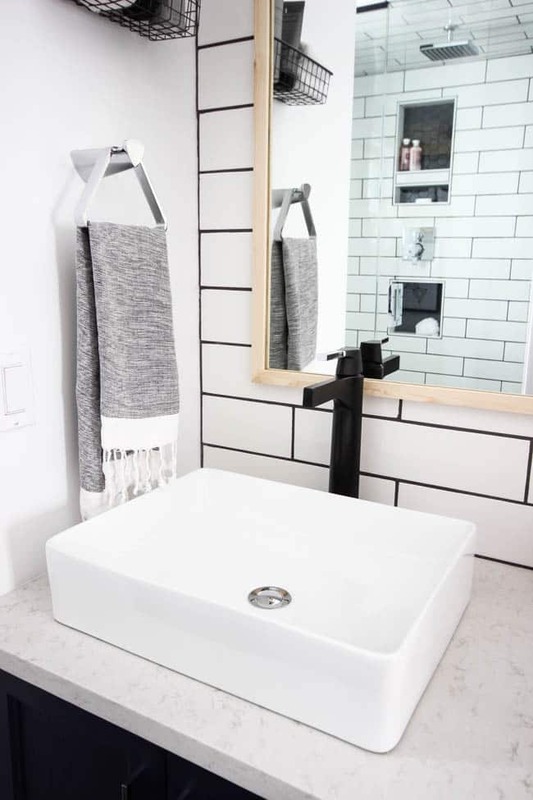 Did you use a matte white subway tile or glossy? Hey! Thank you so much! 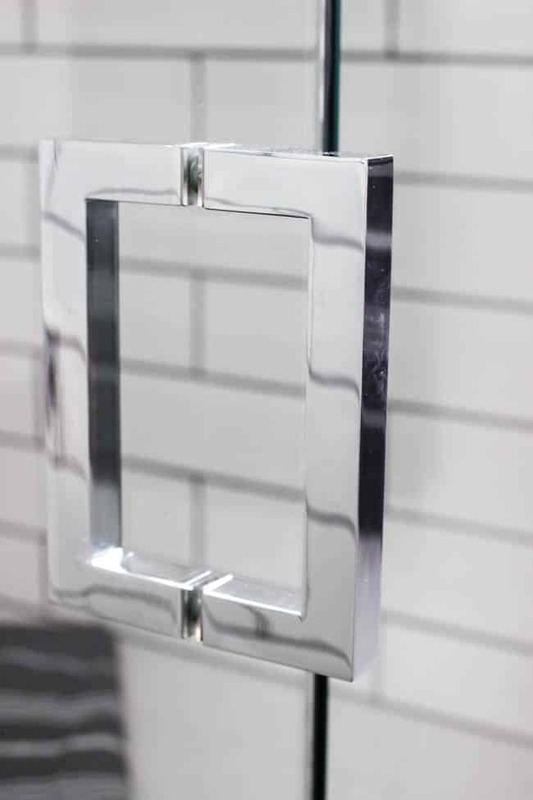 Our tile was definitely on the glossy side, but not as glossy as glass tile (if that helps, lol). 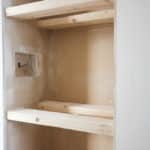 What did you use inside the shower cubbies to get the finished edge without using bull noise tile?